IT WILL NOT BE HIGHER THAN STATED!! AND SEE OUR "STORE TOO FOR SPECIAL OLD RARE MINT ONE OF A KIND "FENTON!!! ALL GUARANTEED TO BE AS DESCRIBED!! THE CAMEO OPALESCNET STICKS ARE DUAL PURPOSE THEY WILL TAKE THE NARROW TALL TAPER STICKS, OR THE TURN OVER TO HOLD THE LARGE FAT PILLAR CANDLE STICKS! 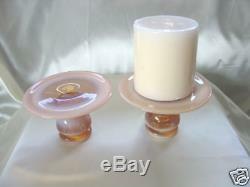 THE BOWL IS OVER 4" HIGH BY 9 3/4" WIDE THE CANDLE STICKS ARE 4" TALL BY 4 1/2" ACROSS THE FOOTED BOTTOMJUST EXQUISITE & GORGEOUS!!! THESE ARE NTO THE REISSUES FROM THE LATE 1970'S AS THOSE WILL HAVE THE FENTON LOGOS INCISED IN THEM THESE ARE THE ORIGINAL "CAMEO OPALESCENT" PRODUCTIONS FROM THE 1920'S AS THEY ARE UNMARKED!! 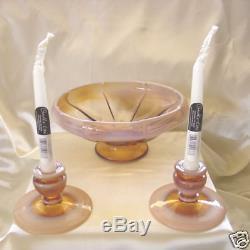 NOTE: THE WAX CANDLE STICKS ARE NOT INCLUDED!! ALL OF THE PIECES ARE IN MINT CONDITION NO CHIPS, OR CRACKS NO REPAIRSNO WEARNO WATER STAIN SICKNESSGLASS QUALITY IS A1 PERFECT "IN ROUND" SHAPES ALL PIECES STAND STRAIGHT, SIT LEVEL AND DO NOT WOBBLE!! WONDERFUL RARE MINT SHOW AND GIFT QUALITY EXAMPLES! WE WILL RESPOND TO LET YOU KNOW WE HAVE RECD YOUR EMAILS. WE ACCEPT CREDIT CARDS AND PAY PAL. PLEASE WAIT FOR YOUR INVOICE! PLEASE DO NOT PRE-PAY FOR YOUR ITEM! 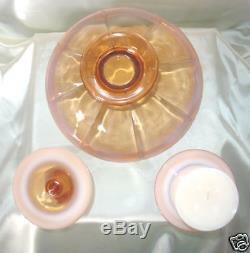 The item "MNT+PERFVINTAGE1920sFENTON GLASSCAMEO OPALESCENTCONSOLE BOWL+CANDLE STICKS" is in sale since Sunday, March 29, 2009.